Celery sticks or tortilla chips. Saute garlic and coconut oil on med low heat. Add cauliflower and hot sauce, cook on med heat with lid on for about 15 minutes until cauliflower is soft, stirring occasionally. Add cream cheese, blend in and heat through. If you like, you can blend these ingredients with a stick to make them smooth. 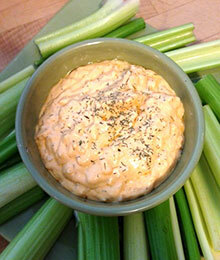 Add yogurt and dill and serve in warmed bowls with celery sticks or tortilla chips.